Yes, it’s true. 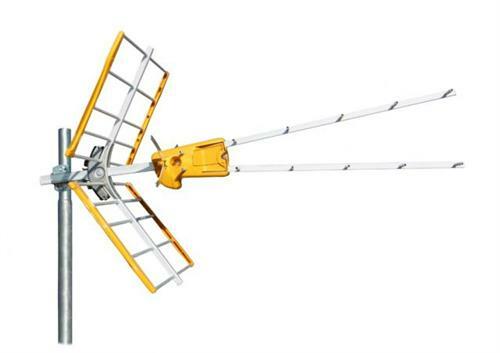 We offer this Televes v Zenit UHF TV antenna for a price much lower than our other award-winning Televes antennas. It’s made in the same factory and even carries the same warranty. So how can it be that it’s so much less expensive? The v Zenit is custom made to be an entry-level antenna. It doesn’t have the advanced features of our other antennas like built-in amplification or active LTE filtering, although you can add an external amplifier if you would like. It doesn’t pick up VHF signals very well, although it doesn’t have any filtering so if a signal is strong enough this antenna will pick it up. If you were to compare the v Zenit to Televes’ other antennas, you’d probably notice that the aluminum pieces are a little thinner too, but compared to some of the pieces coming out of Asia, the v Zenit is still a tank. You should choose this antenna if you are starting to get into antenna television and you’re 25-45 miles away from the towers. Compared to other antennas in the price range, it’s much better built, meaning less chance you’ll be getting up on the roof to adjust it. That’s important to you especially if you live where it snows. You don’t want to find that your antenna is bent and there’s nothing you can do about it until the spring thaw. This is also a good entry-level antenna because it will give you an idea over the course of a year how good your reception is going to be. If you find you need a stronger antenna for long-range reception, you can upgrade and not feel like you wasted a lot of money. But more importantly, this antenna won’t force you to upgrade because it broke unexpectedly. Folks, it comes down to this. Start with European-made quality. Add real value, and you get the Televes v Zenit UHF antenna. You’ll find it at Solid Signal, right now. Xtreme Signal HDB8X — the antenna that does tricks!